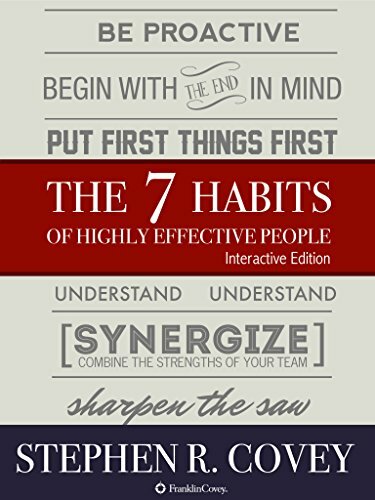 It’s no doubt you’ve heard of “7 Habits” if you haven’t read it yet, it MAY NOT be time to read it now. For example, I continuously found myself comparing what was happening in my life to what I had just read. If someone said an insulting thing to me, my initial feeling would be anger, but on the heels of that thought would come something I’d read in 7 Habits. I’d think, “Hey! That reminds me of when Covey wrote about ___________.” And by the time that thought was gone, so was the negative situation. The 4th habit was my favorite. It’s called “Seek First to Understand, Then to be Understood.” I wish I did this more…now that I’m married! However, back then, this helped me to become a very good “Speaker.” I could talk to people and help them not “drown for psychological air” around me. People want to be understood. If you argue your point all the time, no one feels understood and ideas are harder to be put into action. ANY IDIOT CAN ARGUE! The whole world seems to place a huge importance on debate…and being able to destroy other people’s points of view with your logic and wit. I once shared this concept with an opinionated individual. They started yelling at me and saying I was wrong and that if you know you’re right; you need to stand up for yourself and prove the other person is wrong. With a grin on my face, I replied, “Maybe you’re right.” LOL! They didn’t even pick up on the fact I had just done to them what I was advocating. It’s amazing what happens to people when you state back to them what you think is the point they’re trying to make. You’ll end up starting a lot of your sentences with: “…so, what you’re saying is….”. Once you begin to show the person you’re not there to argue, their backs go down; the urgency in their voice drops; they calm down, and then they listen to your point without fighting.